Note: the image above is a mistake. The word ‘No’ should be inserted after ‘UK’ and before ‘Border’. So, last year saw the addition of about one Coventry’s worth of new citizens to the population of the UK; some 318,000 people. Our nation is grappling to accommodate and provide work and public services for one substantial new city per annum. The level of migration on to the UK’s shores is now without precedent. No problem though: the Prime Minister is going to renegotiate something with the Brussels bureaucrats. That’s alright then. Let’s be honest, this immigration issue would appear to be getting a little out of hand. The difficulty is that when a nation cedes its sovereignty to a few thousand unelected, unaccountable bureaucrats working out of a gin palace in a foreign country, the aforesaid nation (the UK in this case) kind of, er, loses control of its borders – amongst the loss of many other facets of national governance and law-making, of course. Apart from those of us who are members of, and vote for UKIP (circa 4 million at the last count), few folk seem to understand how desperately serious this matter is becoming. We’re talking about the wholesale loss of control of our society here which, of course, is the subversive mission of the European Union as its mafia moves us through ‘ever closer union’ towards becoming a United States of Europe. Oh well, let’s see if Dave can negotiate something with those bureaucrats. All the best with that one Dave. Meantime, the UK is a signatory to the Lisbon Treaty which, by and large, is non-negotiable. However, I guess Dave might be unaware of that minor detail. On the other hand, Dave’s also on record as saying that in any referendum on the UK’s continued membership of the EU, he and the Tory Party are already in the ‘Let’s Stay In’ camp. So is the Labour Party. So is the Scottish National Party. So are the Liberal Democrats. So is the Green Party etc etc. Well not quite true actually. The year before last the trend rate of UK population growth was about one city of York every year; say 200,000 citizens. Last year we experienced a new Coventry being added to our islands – a bigger city than York. At this rate, of course, the maths suggests that this year we’re growing at the rate of one new Bristol per year – an even bigger city than Coventry; so that’s a cool 430,000 new neighbours per annum arriving somewhere in your community as we blog. I just hope that all of my non-UKIP friends (and enemies alike, I suppose) who are of an alternative political persuasion – Tories, Socialists, Scottish Nationalists, Liberals, Greens and so on – have a cunning plan for coping with a ballistic-come-exponential rate of UK population growth. I hope you know where all this is going to end … because I’m as sure as hell that I don’t. PS Please read drtimmorgan’s comment below to understand the true horror of the migration story. I was watching a TV program about Northern Ireland the other night, I was surprised at just how tense the situation is there still. The IRA may have ceased their activities for now, but there are other terrorist groups springing up and isolated acts of violence, all ready to kick off again at a later date. The Protestants and Catholics in Northern Ireland will never be able to live with each other it seems: so what chance do we stand of living peacefully with Islam in a densely populated country like the UK? I reckon, no chance at all of us indigenous Brits being able to coexist peacefully with Muslims, they’re a totally alien culture. It’s just a question of time until the UK explodes into racial violence. Successive governments of whatever party have left us a toxic legacy that is going to cost a lot of lives. What our governments are guilty of, is not just incompetence, but treason and plain criminal behaviour. It’s been a very long time since the UK had a government that represented the people that it was elected to represent. I’ve lived in third world countries, I’ve seen what happens first hand in densely populated countries, where their economies can’t support everyone; it’s what you in the UK have to look forward to. When this happens, society will become even more polarised along ethnic lines and the violence will start. Overpopulation is one of the worst curses that can blight humanity and your elected governments have willingly chosen to inflict this upon you. As a boomer, I voted FOR the EEC in 1975, but of course this was the greatest miss selling scandal of the 20th Century. I want the In/Out referendum to put right a wrong, and give the opportunity to those 57 and younger, who now have to endure this undemocratic, sovereignty absorbing ‘Death Star’, that the EU has become. Why are young people (20’s to early 30’s), in favour of the EU? Has our educational system somehow participated in the realisation of H.G Wells prediction of society subdividing into Eloi ( young, naive, pleasure seekers), and Morlocks’ ( Cannibal Global Corporations dwelling in the shadows and dark recesses)? It is of course unfair to say that *all* young people are positive to the EU, but it is certainly my experience that a great deal are in favour of the EU. 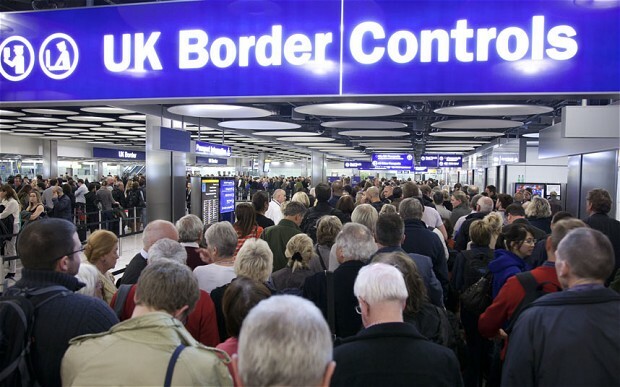 Why does this ‘open free flow’ of immigration from the EU, causing ever more problems of access to housing, schooling, health,…etc,… not worry them as much as it worries me ? It is very clear that in addition to the desire of the corporate lobby for low-waged – and easily exploited – workers, this massive immigration is intended to avert the evident fate of the Continent, which is ageing very rapidly and soon will be unable to pay pensions as the percentage of contributing households (the most economically active) declines below viability, however high the taxes extorted in France, Spain, Italy, etc. Youthful immigrants and their progeny = high household formation rate, or so they think. Sacrifice of a nation, and social cohesion and stability, to a dubious economic theory which cannot apply in the age of resource constraints. Thanks Old Saxon. It’s the extent to which we’re sleepwalking into social disintegration that probably bothers me most. The rate of politically-engineered immigration to this country is truly unprecedented. It’s a moot point whether our society, any society can absorb, accommodate and sustain economically and socially the number of human beings now avalanching into communities up and down the land. My own view is that over the next 5 – 10 years, if this rate of net inward migration is allowed to continue then we really will see a catastrophic failure of public services, coupled with a growing risk of societal tension and the consequent break down of law and order as tensions rise. Is anybody seriously suggesting that the unending arrival of hundreds of thousands of new citizens on to these shores, year in, year out, could in any way result in the flourishing of settled and economically sustainable communities throughout the nation? In other words, that the quality of life in the UK will somehow improve as the population density increases inexorably, and as public services – already stretched to the absolute limits – continue to crank up the national debt with each passing day. I don’t think it’s a moot point at all; you’re being too kind. It’s a recipe for the disaster you outline. worse in some areas than others. or with much wider latitude than was ever given in any recent war zone. Broad brush, I know, and sometime post 2015 . . .
* after QE2 has reigned longer than Q.Vickie. You know, reading these comments and hundreds of others like them, is a depressing experience. It’s a bit like watching a film in which the great catastrophe nears and nears, until some brave chap (assisted these days by an obnoxious, precocious child) saves the world- but this is real, and no-one is going to save us. The scene is set- all potential free spirits hampered by political correctness and indeed restrictions on free speech, even it seems free thought; a political class almost entirely despised for their troughing and deviousness; a populus absorbed in social media or TV or football or shoppingl; a press almost without an understanding of objective reporting; and a state broadcaster which puts a twist, conveys a message, in nearly every programme. It must have been like this in the late 30s: a nation waiting for the catastrophe to come, half believing it couldn’t happen again. But it did. 2015 May 7th was our last chance. And we lost it. Thanks John, and depressing indeed is the situation. Rather like the 1930s – as you say – we are sleepwalking into total disaster here. Ninety-odd percent of the British population is oblivious to the unfolding disaster, accusing folk like Farage and the UKIP membership (which includes me) of being bigoted, xenophobic racists. In fact, all we’re concerned with is the legitimate governance of our own sovereign state. Regrettably, that governance of our sovereign state has been ceded by our political class to the European Commission. We have lost control of our society, which was always the plan of the European and UK political elites. We’re on the road to the United States of Europe and there ain’t a lot we can do about it. I fear all is lost MM. With a FPTP voting system, UKIP will be forever hobbled and therefore largely unrepresented in Westminster.UKIP’s hierarchy didn’t exactly cover themselves in glory post-GE either. What the hell was all that about? I like Suzanne Evans, she’s engaging and sharp, but what about her loyalty? I’m not convinced Carswell is all he seems either. I wouldn’t want to rely on him in a tight spot.The ‘good ship Dave’ will sail on unmolested I fear, and tie up alongside its Brussels counterparts. The voyage is costing us (Brits) gross, 55m a day by all accounts (literally as well as figuratively), which equates to 33m a day net. For that, we get unfettered immigration. Still, it could be worse: Nicola Sturgeon could be English!There’s a pretty pickle brewing in your neck of the woods eh? Where is it all going to end?Keep up the good work. The ‘net’ migration figures are deliberately intended to obfuscate. Had Cameroon got the number down to ‘tens of thousands’ it would still have meant 300k+ new arrivals p/a. As it is, the sum of outgoing (250k?) plus incoming (550k?) is the measure of the total social change (and concomitant costs, social and financial) that is corroding Britain today. Rocket scientists out, illiterate goatherders in. UKIP refuses to use the word ‘invasion’ and accept that alien cultures will in time (a short time?) demand important changes in the country and, if not conceded, will begin violent activity. If we thought ‘the troubles’ and the IRA bombings were bad . . . The result of May 7th will be hugely damaging to the futures of our children and grandchildren. We must, however, not give up resistance. UKIP as constituted cannot achieve much, I fear, but even a little is better than nothing, or, as in the case of the legacy parties, even more of the same. PS Any Polish shops near you? Maybe not. As and when one is found, go in and look for some cheddar cheese. Do let me know if you find any . . . I fear that, in the unlikely event that we are offered a referendum, the disinformation and propaganda will be so heavily in favour of staying in that the uninformed and broadly uninterested majority will ensure that our country will not be around in 50 years. You saw the BBC’s pre and post election bias against UKIP. You ain’t seen nothin’ yet! Yes, chip, like you I am anticipating the pro-EU propaganda equivalent of the military term ‘the use of overwhelming force’. We can bet our bottom dollars that the mainstream political class, the BBC, other mainstream media organisations, big corporations, business institutions, the European Commission, Uncle Tom Cobley and all will be chucking billions of dollars in to persuading our often uninterested and usually ill-informed (deliberately or otherwise) fellow citizens that to leave the EU would be to take our society back to the Stone Age. Incidentally, using the net figure, as the media does, is in my opinion somewhat misleading. Actually, about 600,000 people moved in last year, whilst around 300,000 left for pastures new. Further analysis shows that these are not grannies moving to Benidorm – they tend to be a lot younger than that, and they are going to countries like Australia, China, Canada and America, not to retire but to make new lives for themselves. They are often highly skilled and qualified people, indeed otherwise they could not get in to countries like Australia. On the EU, there is no doubt that almost all politicians from the established parties want to stay in. The corporatists want “a flexible labour market” (which exerts downwards pressure on wage costs) and “access to the market” (for businesses, that is, not for consumers). As for the EU regulatory burden, big businesses actually LIKE regulation, because it is a much bigger handicap for small competitors than it is for entrenched corporates. Although I’m relieved to see Labour rejected by the voters, I’m not encouraged by the new government’s early actions. EU renegotiation won’t achieve much, but we know that the corporatist spin-machine doesn’t need much grist for its mill. We should expect massive corporate financial bankrolling of the pro-EU campaign. Second, the plan to scrap the Human Rights Act is disturbing. The new “British Bill of Rights”, coming as it would from Westminster, is likely to be about as straight as a corkscrew. The Human Rights Convention is NOT an EU institution, but something that has been accepted for decades by every civilised nation in Europe, so withdrawal would make Britain a pariah. It is also written in to the Good Friday Agreement, and the devolution arrangements for Scotland and Wales, so withdrawal would accelerate the unravelling of the United Kingdom. The government plans to penalise illegal immigrant workers – fine, as far as it goes – but why, yet again, has a huge banking scandal led to shareholders being fined but the actual miscreants (and their bosses) let off scot-free? Thanks Tim and I’m aware that you’ve highlighted the key point about migration before, rather than the tendency (like my own) to focus on immigration. I should know what you mean. My own ‘children’ contemplate emigration from time to time, one a science graduate and working in the energy industry, the other an arts undergraduate considering all of her work options on graduation. The General Election result was indeed the curate’s egg. The British people – well the English actually – seemed to reject unreconstructed socialism whilst fearing equally the nationalist-socialism of the Scots. That’s left us with a Conservative Party which wouldn’t recognise conservatism if it ran over it in a tank. I have no time at all for socialism, for all the time-honoured reasons (take a look at the ultimate result of socialism: Greece); however, like you I’m deeply suspicious of the Government-by-Default that we have now. Oh, how I would love to have seen 80 UKIP MPs in the House! It would have been legalised, libertarian, anarchy. As it is, I fear that the politics of corporatism could well prevail over the coming years. Those of us who care about democracy, freedom and libertarianism will need to redouble our communication efforts.